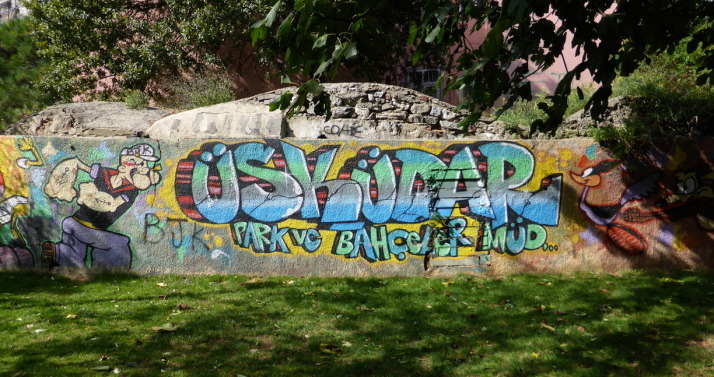 This time our chosen walk from Strolling Through Istanbul took us around the coastline of the Asian shore, opposite the mouth of the famous Golden Horn. This one is chapter 16, page 372, and even though we’ve done quite a few of the walks in our guidebook and find them quite straightforward, for some reason we got lost between nearly all of the sights! The book opens with an explanation of why the architecture in this part of the city isn’t as old as those on the European shore, because it lacked massive wall defences and was therefore razed numerous times. For this reason it’s still a fascinating place to visit, as far fewer tourists make the short ride across the river so it has a much more local, laid-back feel to it. Even though there aren’t any monuments dating to the Byzantine period, the Ottoman royal families liked to build mosques and pious foundations across the river in part for the same reason we wanted to visit – because it allowed them to escape the bustle of the centre. 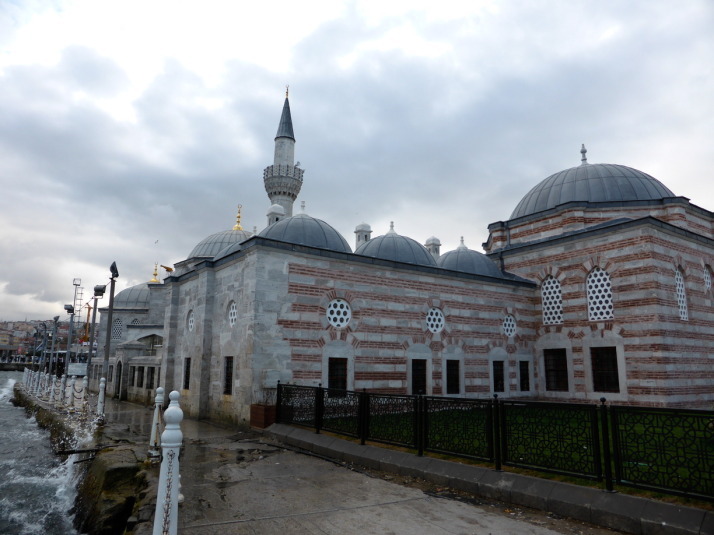 Our favourite sight of the day was the cute riverside mosque called Şemsi Paşa, described as one of Sinan’s most delightful smaller külliyes (a complex of buildings, centred on a mosque). 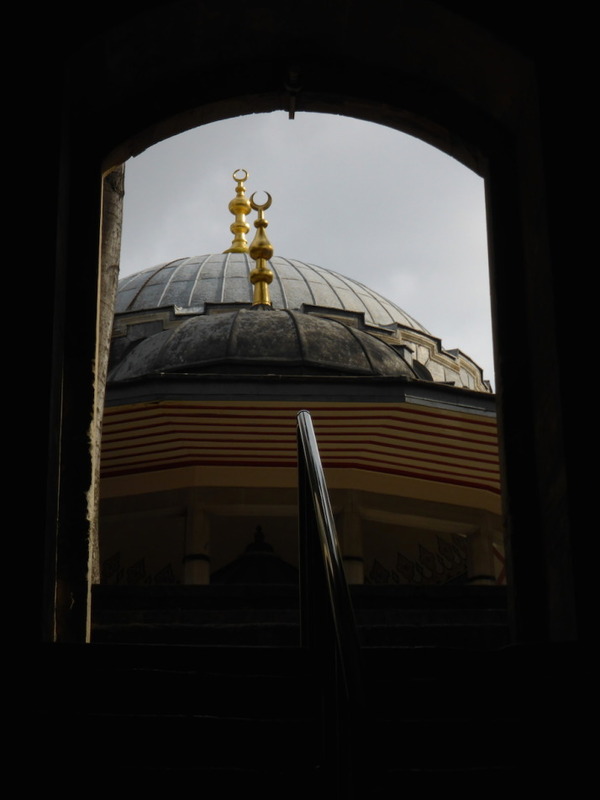 When we entered we were greeted by the friendly imam who handed us a sheet of information in English, asked us if we spoke Turkish or German – to which we said no and apologised for not knowing either – then he proceeded to give us the tour. In German. 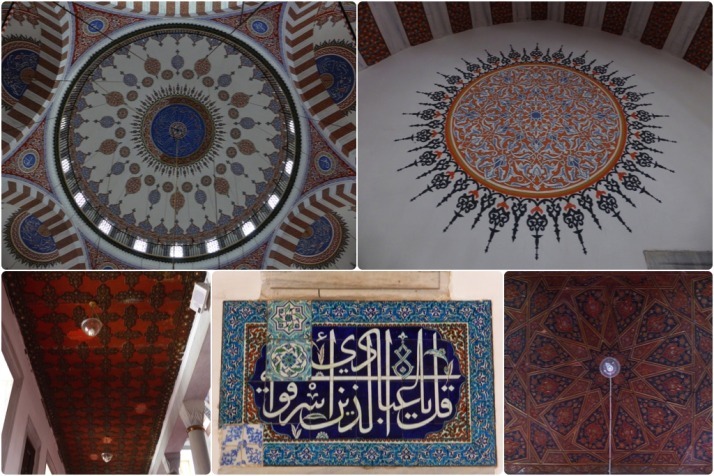 We got the gist and he was delighted to point out a few of the unusual features of the mosque, such as the türbe being attached and visible through a grill in one of the walls, and perhaps the coolest mihrab in Istanbul if not the world.. it has spinning marble columns! The imam showing us and 3 other visitors from England some of the unique features of this quaint little mosque, like the spinning green marble columns in the mihrab! 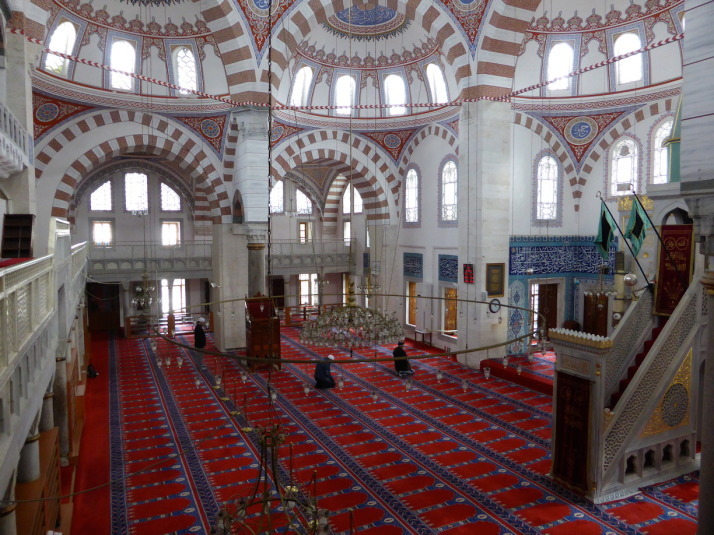 Prominently positioned on the crest of the hill overlooking the end of Üsküdar and the mouth of the Golden Horn is the imposing baroque Ayazma Camii. 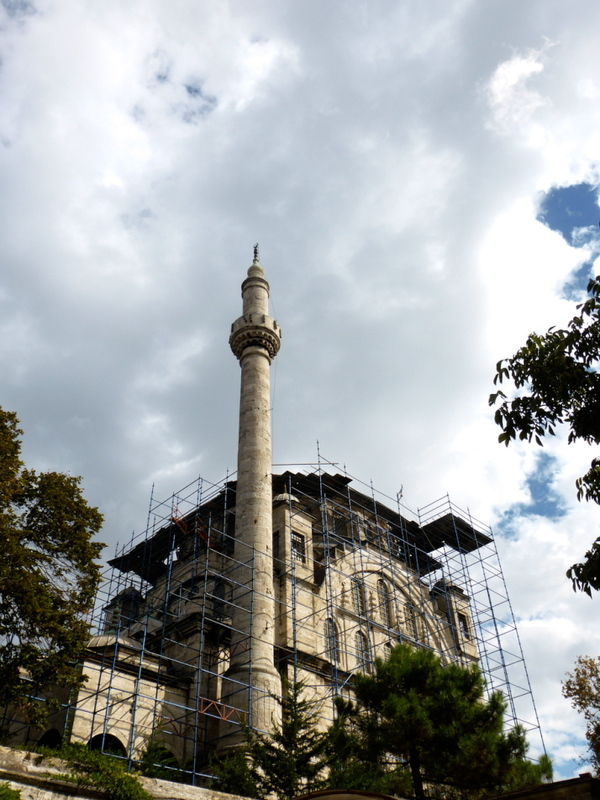 A dark, towering hulk of a mosque which we were glad to see being restored, but sad we weren’t able to look around as it was completely surrounded by fences and scaffolding. After a long walk up the main street from the ferry port, we came to another külliye with a vantage point over the Bosphorus, also designed by the hand of the great Sinan, the lovely Atik Valide Külliyesi. 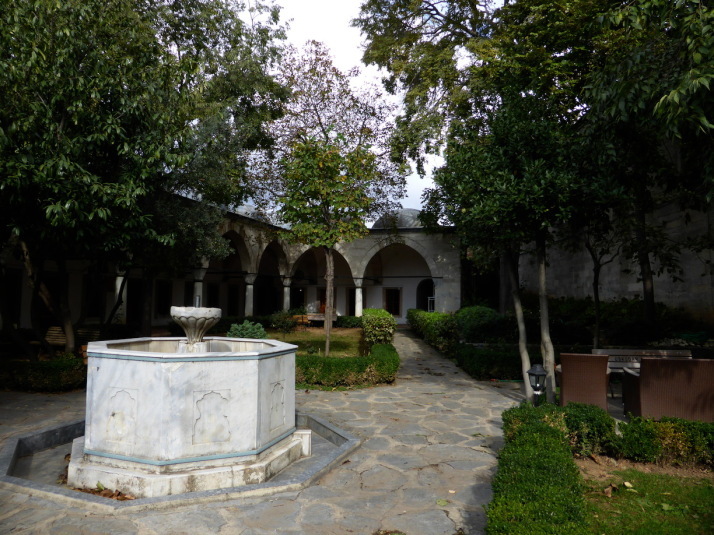 Described as the “most splendid and extensive of of all Sinan’s constructions in Istanbul with the sole exception of the Süleymaniye” it consists of a medrese (school), a hospital, an imaret (public kitchen), a tabhane (hospice for travelling dervishes), a dar-ül hadis (school for learning sacred tradition), a dar-ül kura (school for learing the Qu’ran), a mektep (primary school), a kervansaray (inn or hostel for travelling merchants), and a hamam (public bathhouse) – remarkably all of the them still exist today, though in various states of repair. The main access to the medrese is opposite the mosque, but finding the doors locked we wandered down to the side entrance to find it also closed. We tried the handle and tentatively pushed it open, stepping inside. An old man sitting at a table with a drink locked eyes with me, and in my best tourist charades I asked if it was OK for us to enter. He motioned to one of 3 younger guys moving chairs who looked up, saw us and gave us a most welcoming gesture. 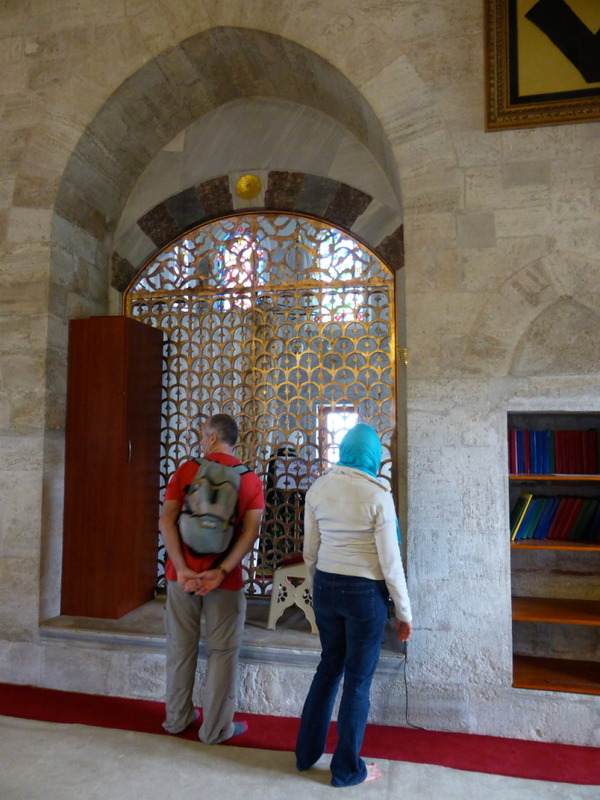 After we’d had a good look around, the young guy came over to meet us and opened up the main door back to the mosque which afforded a lovely framed view of the domes of the şadirvan (the ablutions fountain) and the mosque. 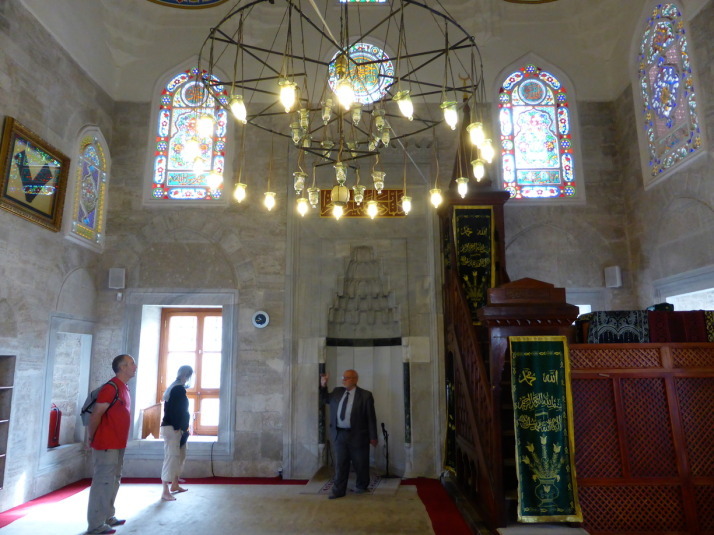 The mosque and the medrese where the only buildings that it was possible to enter – indeed the kervansaray looks to be an advanced state of decay, but, like many of the old buildings across Istanbul, is currently being restored. For all there were only a few highlights for us on this stroll, it was nice to get a different, more local feel for the city. 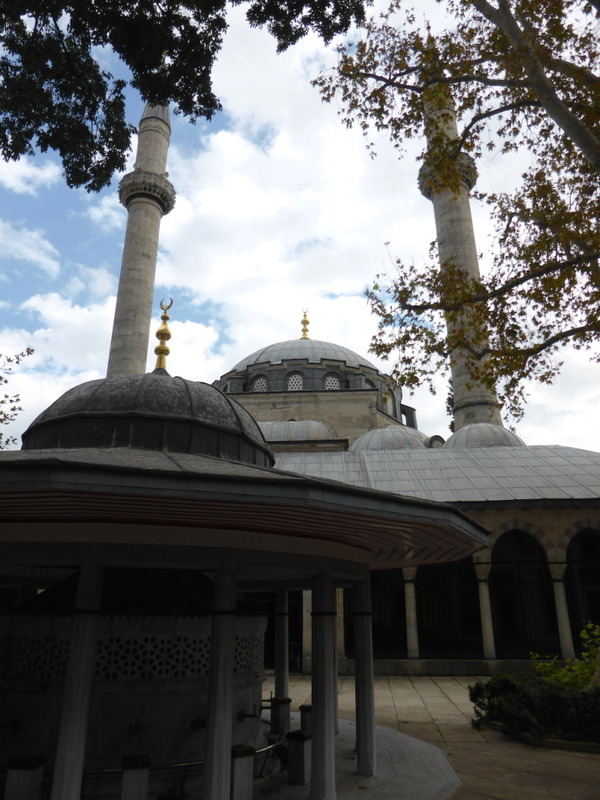 This entry was posted in Experiences, Places and tagged Istanbul, mosque, Strolling, Turkey on October 30, 2014 by Andrew.